Poinsettias, Santa Claus, wreaths, ornaments, and more...you know what time it is? It's Christmas in July! 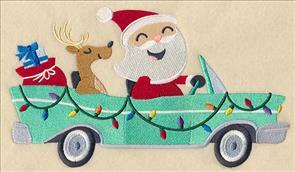 Start prepping now for the merriest season of the year with all new Christmas designs! 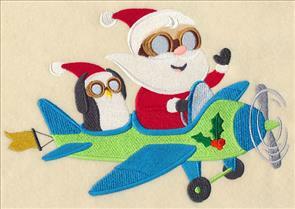 Each of the holiday motifs are designed to help you get a jumpstart on your holiday stitching. 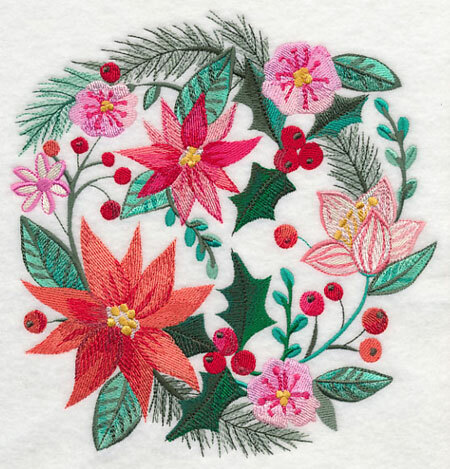 New Christmas floral designs are terrific for pillows, quilts, and more (think a wreath, border, and corner combo! 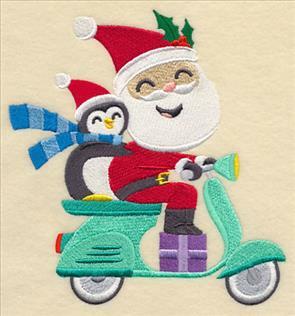 ), while adorable Santa On-the-Go designs hit the Christmas cute factor perfectly! 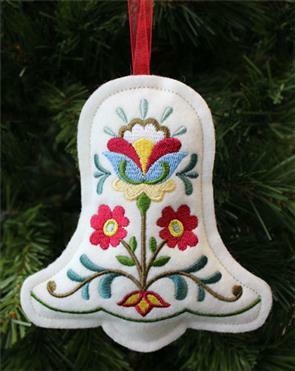 Deck your halls with new elegant holiday motifs, or just your tree with all new in-the-hoop embroidered ornaments. Enjoy the head-start on your Christmas inspiration! 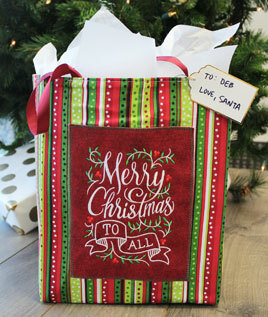 This year, give your Christmas presents in personalized gift bags! Learn how to make the reusable bag here. Stunning holiday flowers, brilliant greenery, and vibrant berries come together to make this beautiful Christmas wreath. 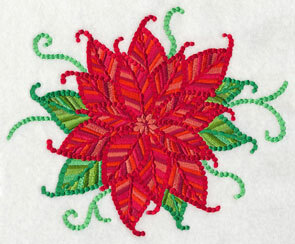 The gorgeous potpourri of petals is a great way to add holiday cheer to quilts, pillows, and more. 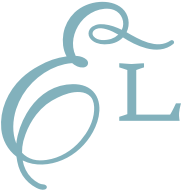 7.48" x 7.77" and 6.89" x 7.16" and 5.86" x 6.10" and 4.86" x 5.05" and 3.71" x 3.85"
Tea towels, placemats, and other home decor get an eye-catching update when adorned with this festive flower spray. The vivid Christmas design uses varying shades of reds, pinks, and greens to add an elegant look to your holiday decor. 6.88" x 11.64" and 5.56" x 9.38" and 4.60" x 7.79" and 4.05" x 6.85" and 2.33" x 3.86"
Poinsettias, holly and ivy, and other winter flora fill these lovely designs with blooming holiday flair. 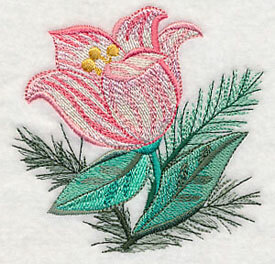 Stitch a border of the winter greenery along tablecloths, pillow case edges, linens, and more. 11.74" x 4.85" and 9.40" x 3.87" and 7.78" x 3.22" and 6.00" x 2.66" and 3.84" x 1.85"
Highlight a pocket, napkin, or placemat with these corner and accessory designs! 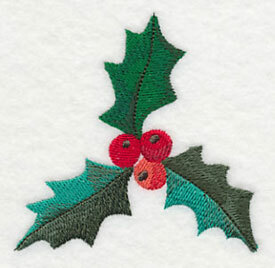 The holly and berries are a particularly great choice when looking for classic Christmas motifs. 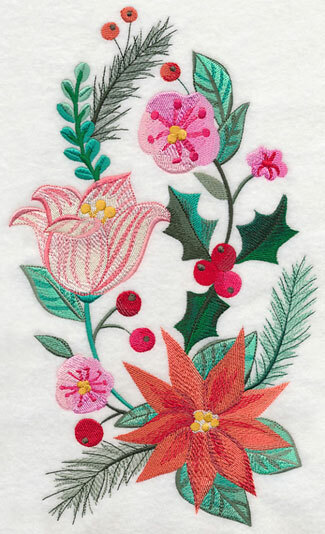 A pair of gorgeous winter flowers is a terrific way to finish off this series of Christmas embroidery designs. 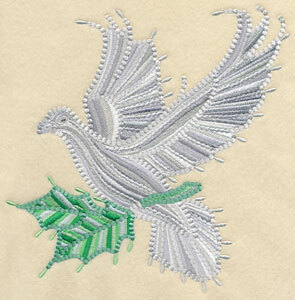 Stitch them alone as focal points on jackets or pants pockets, add them to a quilt, or use them on holiday linens. The beautiful potpourri of petals designs are sold singly; use the links above. Or, get them all in a design pack! 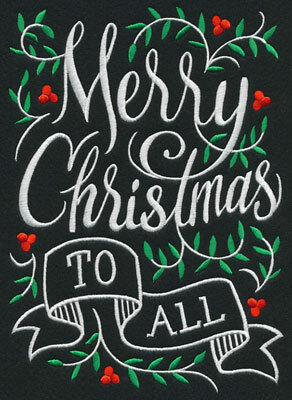 **XL - Designs smaller than 6"x 10"
Wish your friends and family the best of the season with a pair of charming, cheerful blackboard-inspired designs. 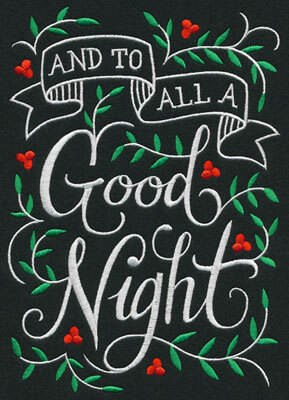 The uplifting quote is the perfect addition to any wall hanging, pillow, or tote bag. 6.84" x 9.60" and 5.56" x 7.81"
6.85" x 9.62" and 5.56" x 7.81"
4.85" x 6.81" and 2.76" x 3.88"
Santa and his North Pole friends are heading your way! 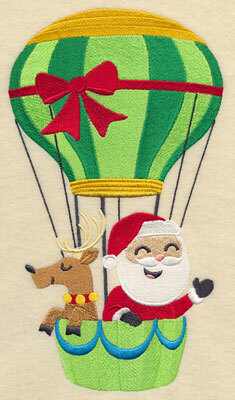 Whether he's zipping along on a scooter or flying high in a hot air balloon, this on-the-go Santa is perfect for starting your holiday stitching! 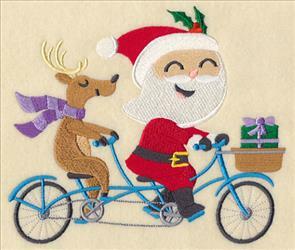 5.24" x 9.41" and 3.82" x 6.86" and 2.15" x 3.86"
Santa and a reindeer deliver a Christmas present on a tandem bike; he and a penguin tote a Christmas tree on the back of a motorcycle. 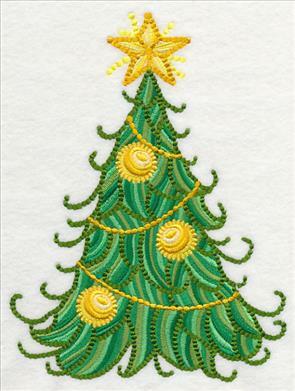 These fun and friendly designs are great options for stitching lighthearted holiday projects, such as kid's gifts, mini-quilts, t-shirts, and more. 7.53" x 5.86" and 6.23" x 4.85" and 3.86" x 3.02"
This year, Santa's traded in his sleigh for other modes of transportation for his midnight ride. We especially love how this classic car is merry and bright with twinkling lights and the holly and berries add festive flair to his airplane. 8.53" x 5.86" and 6.56" x 4.50" and 3.86" x 2.65"
These Santa on-the-go designs will get you itching to start stitching for the holidays! 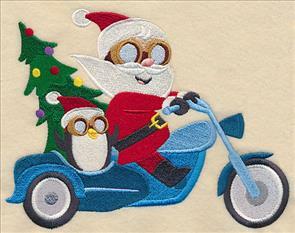 Pick your favorite Santa design, or get the entire collection for one low-ho-ho price! 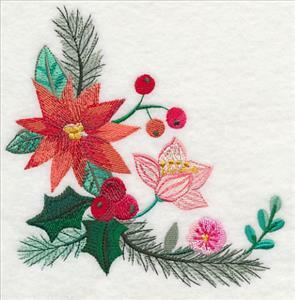 An elegant mixture of intricate stitches and varying shades of color give these classic Christmas motifs a unique, sophisticated edge. 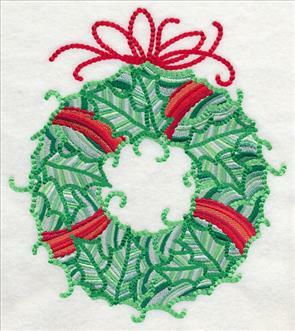 The beautiful designs are particularly stunning choices for adorning pillows, quilts, and other holiday decor. 4.77" x 11.72" and 3.82" x 9.38"
3.17" x 7.78" and 2.78" x 6.84"
We can't get enough of the way these holiday designs use texture and color to add eye-catching appeal to your projects. 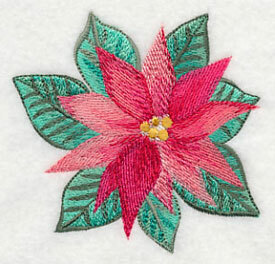 The exquisite poinsettia and wreath designs below will give any Christmas project an impressive look. 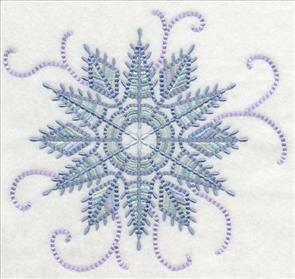 8.33" x 6.90" and 7.80" x 6.46"
6.90" x 7.80" and 5.85" x 6.62" and 4.87" x 5.51"
A peaceful dove and elegant snowflake are delightful additions to your Christmas projects -- stitch them on apparel, tea towels, quilts, pillows, and more! 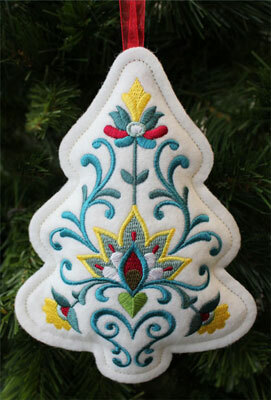 7.51" x 6.87" and 6.40" x 5.86" and 5.29" x 4.84"
Make your Christmas merry with a collection of new in-the-hoop ornaments! 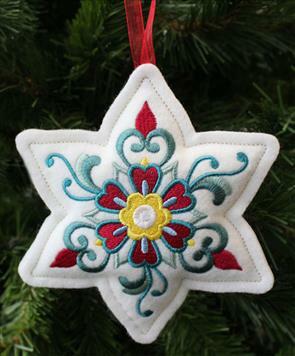 Intricate, detailed designs stitched on top of a soft, stuffed ornament are a creative way to prep for the holidays. 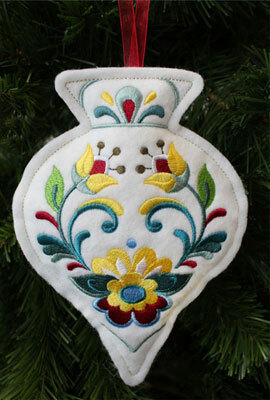 Learn how to make the ornaments here. 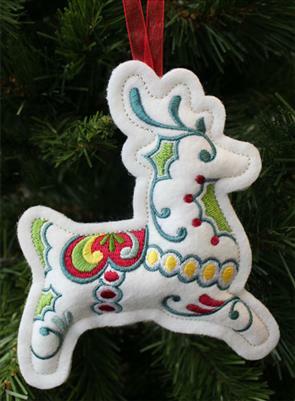 4.82" x 6.30" and 2.95" x 3.85"
Each of the vibrant ornaments are modeled after a classic Christmas icon. 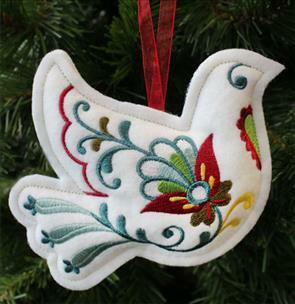 Stitch a vintage ornament, a Christmas tree, a poinsettia, a reindeer, a bell, and a dove -- they're great when hung together! 4.84" x 5.33" and 3.49" x 3.85"
Not only are the stuffed ornaments an eye-catching addition to your Christmas tree, but they're the perfect choice for giving as gifts, too. Stitch one for all of your family and friends! 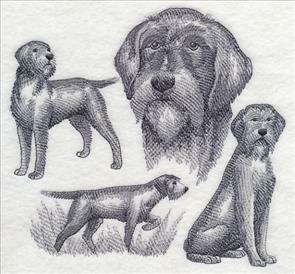 5.76" x 4.83" and 3.85" x 3.23"
Dog breed sketches and silhouettes are always popular, so we love adding more to the mix! 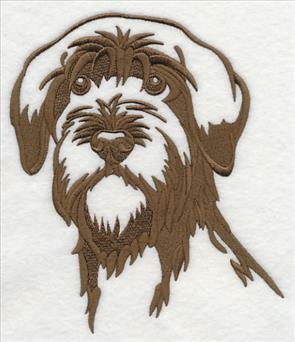 Several of you requested designs featuring the Wirehaired Pointing Griffon, and we were happy to oblige. 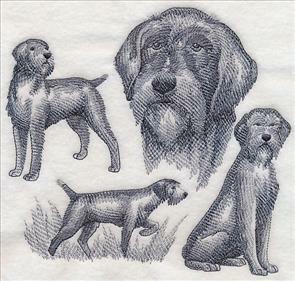 The sketches feature the gorgeous pup in two different ways -- with and without a docked tail. Thanks for the suggestion! 7.34" x 6.90" and 6.22" x 5.85" and 5.07" x 4.78"
5.86" x 6.78" and 4.83" x 5.59" and 3.33" x 3.86"